The very first thing that grabs me about Ben Hogan’s Five Lessons The Modern Fundamentals of Golf is the front cover. (Of course dummy) No, I mean it. It’s an image of Ben Hogan at the top of his backswing. I look at it, and I think, “If I could ever get in that position, I could make any golf ball do darn near anything I want it to do anytime I wanted it to do it.” It’s so classic, so perfect, so stable, so simple, so so so so…you get the idea. I want that! And I think you should too. The next thing that struck me was his absolute belief that “THE AVERAGE GOLFER IS ENTIRELY CAPABLE OF BUILDING A REPEATING SWING AND BREAKING 80, if he learns to perform a small number of correct movements and conversely, it follows, eliminate a lot of movements which tend to keep the swing from repeating.” Those capitalized letters are exactly as written in this book, and he states this belief in slightly different ways a couple more times in the book. I can’t tell you how heartening it was to read that from Ben Hogan. 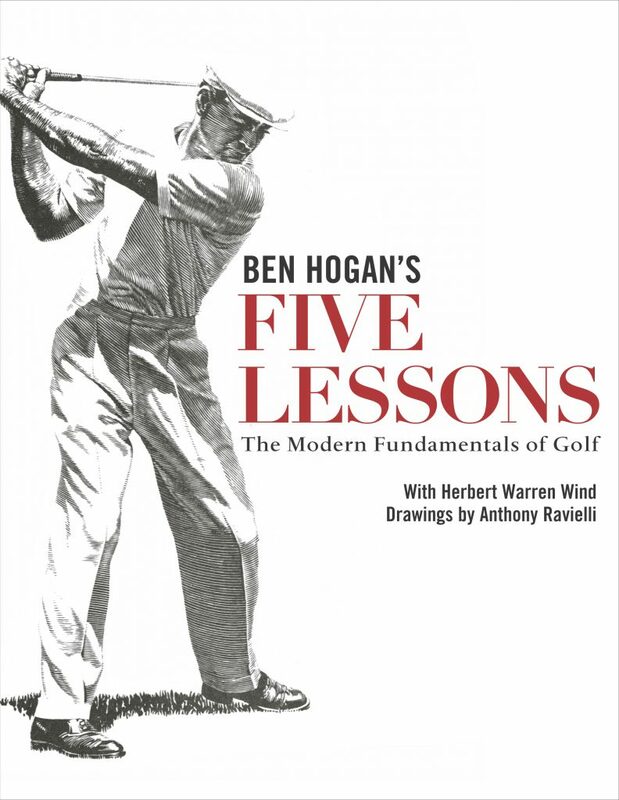 Ben Hogan’s Five Lessons was originally published in 1957 and was republished in 1985. The foreword of the book is written by Nick Seitz, Golf Digest editorial director, at the time. A Hogan “Secret” is given away right there in the foreword and is mentioned no other place in the book. I imagine because it isn’t specifically a fundamental- which is what the book focuses on exclusively. I’ll quote Mr. Hogan on his secret. Mr. Seitz goes on to say that from then on, Ben Hogan “was without peer as a shotmaker.” I believe him. I’m obviously not going to give the Five Lessons here, but I will touch on each and try to give you some insight into the book. Ben Hogan has an opinion on not just where every finger should be placed on the club, but on how much pressure you should be feeling in each finger. But not to worry, his explanations are excellent, as are the accompanying illustrations. He goes into great detail and gives the reasons behind his choice and recommendation. As a result of 1 and 2, all the energy the golfer pours into his swing will be channeled to produce maximum control and power. These are but a few, with many more in this chapter. I want to stress again, how much of an easy read this book is and how perfectly it makes sense when reading his words. The concept of the “Plane” governs the success of the backswing, but it all starts with the waggle. Hogan says this part of the swing begins at address and ends at the top of the backswing. He pays particular attention to the waggle and calls it “The bridge between the address and the actual start of the backswing.” He doesn’t see it as optional and teaches that it is a way for a minny practice swing, and even calls it a “dry run” for the swing to come. As with the rest of the swing, he believes that the left hand (left hand and arm for the full swing) should control the waggle. He even cautions not to “groove” your waggle. He thinks it must be instinctive and unique to each shot you intend to play. The order of movement for the backswing is as follows, hands- arms- shoulders- hips. Below I’ll show one of the excellent illustrations from the book to illustrate the point. The downswing is initiated by the hips, with the shoulders, arm, and clubs following immediately behind. With the stance and posture taught in the earlier chapter, initiate a mini backswing with the body, then, with the body, swing the arms forward. Gradually build momentum until you reach hip height with your hand on the backswing (hinging your wrists) and hip height on the follow through, also hinging your wrists. The body is swinging the arms like a “pendulum of a clock”. Elbows tightly glued to your side the entire time. You will eventually want to progress all the way into a full backswing and follow through. I want to include this quote that begins this chapter before I give you his downswing philosophy. I think this is an excellent way to think of initiating the downswing, but the detail that governs the backswing and downswing is the notion of the plane. He wants you to be brushing up against, but never over, the plane on the backswing, and executing a slightly shallower path on the downswing into and through the ball. The downswing plane should also point slightly right of the target.He uses illustrations of a large pane of glass with a hole in it for your head to give a perfect visual representation of the plane. This section is pretty much as you would expect. He hits the main points in the prior four lessons, along with other notes, stories and thoughts on golf and the golf swing. He gives us a bit of a biography of when he took up golf and the important aspects of the swing he learned along the way, as well as who he learned them from. I found and find this book thoroughly enjoyable to read. I’m on at least my third go around. I’ve completely adopted his method for executing my grip and stance. I’m learning the posture and the backswing as I write. It will take a little effort to fix 25 years of haphazard fundamentals. I hope you find this review useful, and I really hope you pick up this book. It’s the best-written instructional on the golf swing that I’ve seen. My second suggestion is the Arccos 360 Gift Box Bundle Golf GPS Stat Tracking System. It combines a state of the art GPS for accurate yardages for shot to shot intelligence with monitoring and tracking capabilities. I think it’s a game-changer, especially for those of us that like to dive into numbers a bit.